Script Frank Miller, art John Romita Jr. and Al Williamson, all material is ©Marvel Comics. 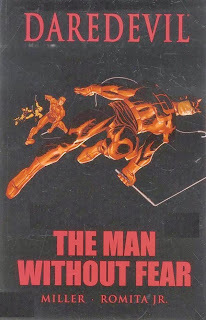 This article deals with hardcover editions of Daredevil The Man Without Fear, including the Marvel limited slipcase edition. I will proceed chronologically. The inner book (10.5 x 7 inches or 27 x 18 cm, ISBN 0-7851-0060-1, 176 pages) also comes as a black leather bound hardcover with red glit embossed illustrations. It contains a bookmark with a red ribbon. This book is sometime advertised as a Graphitti Edition book but my copy doesn't display any reference to this editor. There is no mention of the print number in the book itself, but is is reputedly limited to 742 copies. Second and third of cover are similar (red background). The book is divided into two chapter, one for the main content, and an 18 pages art gallery. Each chapter opens with an illustration printed on tracing paper alongside Braille writings. Ralph Macchio, the original series editor, is in charge of the introduction (one page dated June 1994, next to what seems a Frank Miller illustration). The main content is printed on mat relatively thick white paper and without any references to the original 5 parts division. The bonus section features all of the original covers, unused colored cover for issue #4, four pages prologue from issue #4, pinup from issue #4 (the other one produced for issue #1 opens the main content, see a picture above), and three "behind the scene" pages from issue #5 retracing the birth of the project between Frank Miller, John Romita Jr. and Ralph Macchio in telephone calls form. Now let's move on to Daredevil The Man Without Fear Marvel Premiere Classic Variant edition. Published by Marvel Comics in 2008 (10.5 x 7 inches or 27 x 18 cm, ISBN 978-0-7851-3656-9, 224 pages, cover price 24.99$) in its Premiere Classic line (as #18), my copy is one of the limited print run of 2092 copies that displays a variant dust jacket cover. The inner book comes with a leather bound hardcover with embossed red carvings, and red background on second and third of cover. The Ralph Macchio introduction is of course included as well as the original virgin covers that are used to divide the main content (printed on thick quality paper). How much did you originally buy this for? Also what do think its worth today? 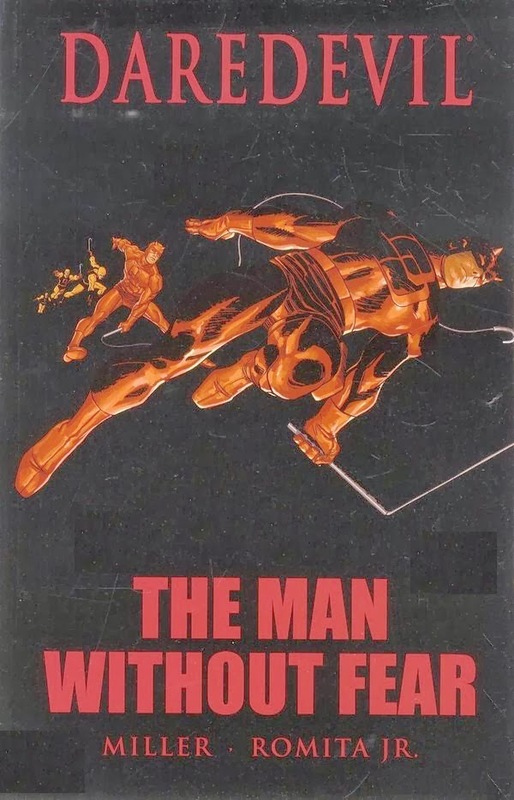 Hello, I had found originally find information on this site http://www.manwithoutfear.com/daredevil-hardcovers.shtml. If I remember correctly I have bought the HC with slipcase for less than $100 on ebay, and the Premiere editions for cover price, on ebay too. I do not think that it would cost more today.